Tasting wine is a personal experience and is also dramatically influenced by your mood and the environment where you taste. Wine tasted during a delicious dinner with old friends or while on holiday at some exotic spot will always taste better. Similarly, when you visit a winery and are invited to taste young wine directly from the barrels, it will taste quite different to when you taste the same wine in bottle. Another curious thing to ponder is that an expensive or rare wine, purchased by another person and shared with you, will generally taste better than if you paid for it yourself! When it comes to tasting wine, here are a few helpful tips that we use at the New Zealand School of Food and Wine to help our students get the most out of wine tasting. Pegasus Bay wines ready and waiting. Pour sufficient wine into the glass to be able to smell and swirl without spilling. Hold the glass by the stem. Smell once or twice before swirling to gain an initial impression. Sometimes it helps to close your eyes to concentrate on identifying different aroma. 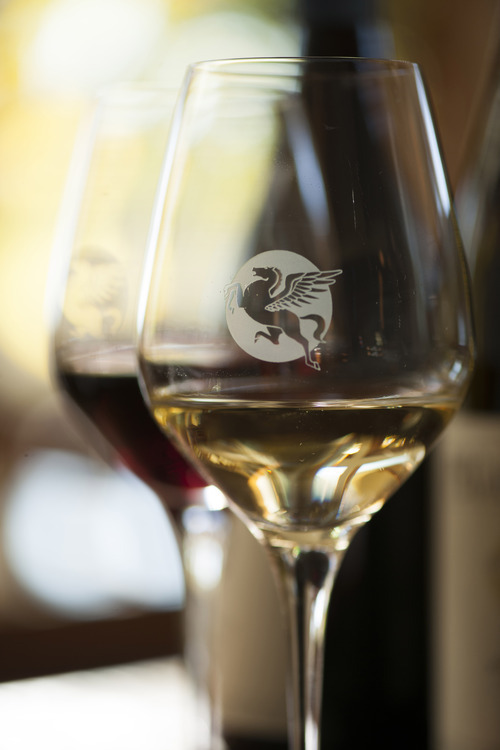 Tilt the glass to a 45-degree angle to look at the clarity, colour and intensity of colour of the wine. With red wine, the more deep ruby or purple, the younger the wine. Generally, as white wine ages it becomes more golden in colour. A wine that is glossy, with subtle colour changes from the middle to the rim, generally means better quality. Swirl the wine in the glass to aerate it. Place your nose above the wine to smell the aromas. Sniff. What can you smell? Sniff again. Write down your impressions. Swirl the wine around your mouth to cover the whole area of the tongue and expose all your taste buds and cheeks to the wine. Hold the wine in your mouth and draw air over the top of your tongue. Spitting a wine, does seem to help you sense more flavours as the wine travels back over your tongue.